In Cambodia, the flower is used as an offering to Buddha. In India, it’s sacred to the god Vishnu and used in religious ceremonies. In China, the flower is processed and used as the main ingredient in jasmine tea. It’s known as Jasminum sambac, a species of jasmine from the olive family (native to South and Southeast Asia.) It is known as the Arabian jasmine in English. (Other countries have other names for it.) The flowers are also used for perfumes. The plant was introduced to Europe in the early 16th Century, although its existence had been known about for some time by then. It probably came into Hawaiʻi in the 1800s. It was the favorite flower of Princess Kaʻiulani. Kaʻiulani liked birds, too … especially peacocks. The name of her birds (peacock – pīkake) carried over to become the name we use in Hawaiʻi for these flowers – the Pīkake. Click here for a fabulous rendition of Lei Pīkake by Hapa. While attending a wedding at Waimea on the Big Island, Kaʻiulani got caught in a cold Waimea rain while riding on horseback with her friends, Helen and Eva Parker (daughters of Samuel Parker.) She became ill; she and her family returned to O‘ahu. After a two-month illness, Kaʻiulani died at ʻĀinahau on March 6, 1899, at age 23. It is said that the night she died, her peacocks screamed so loud that people could hear them miles away and knew that she had died. Princess Kaʻiulani’s mother was Princess Miriam Kapili Kekauluohi Likelike (sister of King Kalākaua and Queen Liliʻuokalani) and her father was Scottish businessman and horticulturist Archibald Scott Cleghorn, who later became Governor of Oʻahu. 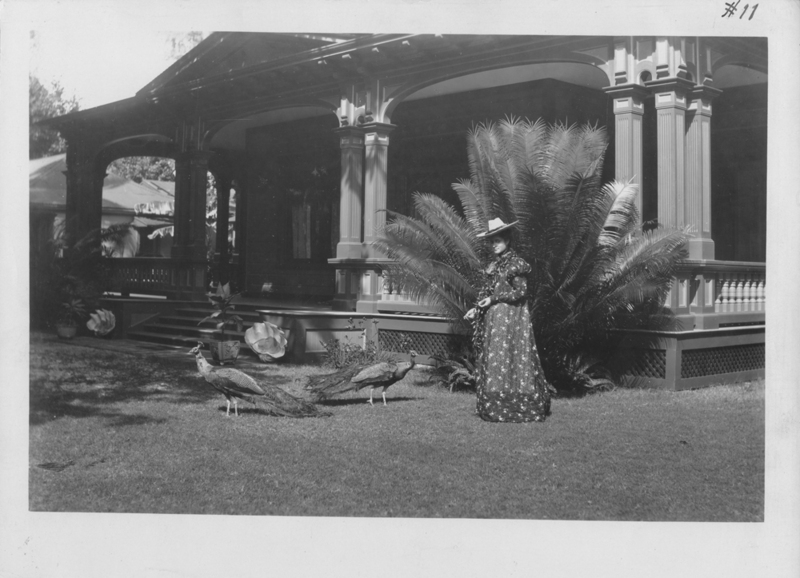 The image shows Princess Kaʻiulani at ʻĀinahau (her Waikīkī home,) with her pīkake (peacocks.) In addition, I have added other related images in a folder of like name in the Photos section on my Facebook and Google+ pages.